Welcome to the official Anime Corner FAQ for answers to questions that we are frequently asked! Here we have compiled our best answers to the most common inquiries we've received over the past 7 years, and we will continuously be adding and updating to this section to ensure it is up to date, and reflects the latest things that you need to know. Of course, as always, if you cannot find the answer to your question here, please feel free to e-mail us - your question (and answer) might even end up being published on this page! Why should I buy my Anime from the Anime Corner Store? How do I subscribe/unsubscribe to the Anime Corner Newsletter? Can you tell me a little bit more about the Anime Corner Store? Do you offer wholesale accounts? Can you tell me who your suppliers are? Where are you located? Do you have a retail store or only sell Anime online? I love the Anime Corner girls! Can you tell me more about them? How does the Japanese manga culture compare to that in the US? Are the Anime titles listed on the store uncut or edited? Do your Anime DVD's have the same English voice actors as the version that I have seen on TV? What exactly does 'dubbed' mean? What does 'Bi-Lingual' mean? What do you mean when you say that an item is an 'import' vs. a 'domestic' item? What does region encoding mean for your DVDs and BLURAY disks? Will they work on my player? Do you carry Japanese language Import Manga? What is the difference between a Japanese Import Music CD and a Domestic Music CD? Are the songs on a domestic CD in English? Can I play Japanese CD's in my CD player? Some of your items have age ratings, some do not? How do I know what age an Anime is appropriate for? What does OVA mean? What is the difference between an OVA, a Movie, and a TV Series? Can you recommend some Anime titles to me? What would you consider the Anime 'A' list of must see titles? I heard that you allow trade ins of used DVD's, CD's, Manga, and Video Games. Is that correct? How can I trade in my used DVD's, CD's, Manga, or Video Games in for store credit? Do you sell used DVD's and CD's on the store? What do you do with items that are traded in? How do I search for an item on the store? How do I get coupons and special offers? How do I know if an item I want to order is currently in stock? What currency are your prices listed in? How can I tell how much an item will cost in my own currency? Why can't I place more than one item in my shopping cart at a time? Why don't you guys show the retail price of the items on the store? If you did, people would better understand how good your prices are! Do you offer discounts or free items to Anime Clubs, libraries, and other non-profit organizations? Do you offer a price matching policy if I find an item selling for a lower price at another store? What if I want my order delivered to my work or school address (instead of my credit card's billing address)? I placed an order, but never received an e-mail confirmation. Did you send one? Can I pay for my order when it is delivered (i.e. COD)? Do I have to enter my ordering information each time I place an order, or do you have a way to create an account? When I tried to checkout, the store told me that my credit card was declined. Why won't it let me complete my order? I live outside of the US and would like to place an order, but I do not have a credit card. How can I pay for my order? If there is a pre-order or backordered item on my order, can I request that the order be held until everything is available to ship together? What shipping methods do you use, and what choices do I have? I am an International Customer. How do I know how much my shipping charge will be? How can I obtain a status on my order? I tried to track my order on the US Postal Service site, and it says that they only been notified electronically. If the package has been sent, why hasn't the tracking been updated? I just placed an order, how long will it take for it to arrive? I'm in the Military stationed overseas. Do you ship to Military APO/FPO addresses? OK, Priority Mail shipping only costs $3.85, yet your minimum shipping charge is $6.00. What is up with that?! I selected Super Saver Shipping on the order form, however, when my pre-ordered item shipped later, I was charged shipping. Why is this, I thought shipping was free? I selected Super Saver Shipping, however, when my order came I found out that I was charged for shipping anyway. Why did I have to pay for shipping, I thought all orders over $99 shipped for free? I ordered a Wall Scroll and another item - why I was charged two separate shipping charges? For UPS 2nd Day and Overnight Air shipping where the shipping charge is based partly on the number of items I order, does a 6 DVD bundle count as one item or six items? If I pre-order an item, when would my credit card be charged? I want to pre-order an item, but I do not have a credit card. What other payment methods do you accept, and when would I have to make payment? I received my order, but one of my items was marked "Backordered". When will I get it? Will I have to pay additional shipping when it is sent? I received my order, but one of my items was marked "Sold Out - No Longer Available". What does this mean, and will the item be sent later? Can you special order a Japanese CD or DVD for me that is not listed on the store? I'm looking for an 'Anime' series, but I do not see it listed on the store. Do you have it or can you get it for me? My order arrived, but one of my items is damaged (or defective). What should I do? I'm having trouble with a DVD. Is my problem a common problem, or is the DVD just defective? I'm having trouble playing a DVD on my PS2 Game Console or DVD-Rom drive. Is the disk defective? If I don't like an Anime that I purchased, can I return it for credit? Please e-mail our Customer Care Center. Thank you very much! Hmmmm.....I could give you many reasons, like great prices, fast shipping, awesome selection, excellent customer service, only licensed products, etc. but I'm not going to say those things (aren't I?.......). This question is probably best answered by our customers, rather than by us. Their voice is the one that counts. I'm glad you asked, because we publish one of the finest, most comprehensive Anime e-newsletters in the industry (much more than just a list of ' what's new ' :-). You can sign up for our weekly newsletter and special reports right here. And don't worry, there is no obligation, and every mailing we send out has an un-subscribe link right at the end of the mailing, so you can opt-out at any time. The expense of a printed catalog in the internet age is prohibitive, so we no longer offer a printed catalog. This helps us keep our prices down, and allows us to spend more money on bringing you the best service and support in the industry. We realize that a couple of our competitors still offer a printed catalog, but you can clearly see the expense of printing it is subsidized in their higher overall prices, and we don't feel that a printed catalog offers enough real value to our customers that they would be willing to pay higher prices for it. In the Anime industry, a printed catalog is usually already out of date to minute it rolls off the presses, while our web catalog is updated on a daily basis. Do you offer wholesale accounts? How do I get started in the Anime business? Can you tell me who your suppliers are? We do offer a limited number of wholesale accounts to retailers with legitimate store fronts or large already developed internet businesses that have at least 2 years experience selling online. We do not offer accounts to new businesses or startups at this time. E-mail Robert with your request - please include your business and credit information (we will need a minimum of 2 years financial statements for open credit terms), a brief description of your business, your FIN, DUNS #, and your State Tax ID number to see if you qualify. Personally we're tickled with how many people e-mail us and ask information about how to start or run an anime business, or ask who our suppliers are. We probably get 1 or 2 e-mails every day asking this question. Sometimes they are very cute and creative: for instance, it seems there are an endless number of people who are doing a 'project' for 'business class' at school, and want all kinds of information about how we run our Anime business. Some claim to be doing a project, but then are not interested in anything except our vendor list or other business critical information. We always get a chuckle out of these requests, and I guess we can't blame them for trying. We have spent many years in this industry establishing relationships and learning the Anime business, so of course, we cannot divulge that kind of information. Finally, if your store sells any sort of bootlegs or other unlicensed material, please do not contact us. We will NOT do business with you! As one of the largest dedicated online anime stores on the web, we don't carry bootlegs, pirates, or unlicensed merchandise! Here at the Anime Corner, you will NEVER FIND lower quality knockoff DVD's or Music CD's like those produced under the labels SonMay (SM), EverAnime, Alion, Archer Records, Miya Records, Golden Diamond Music, etc.. CD's with these labels are reproductions of the original Japanese CD's made by Taiwanese firms who copy these works without license and without paying royalties to the original Japanese artists. You will also not find any illegal or bootleg anime DVDs, VCDs, Figurines, ArtBooks, Wall Scrolls or any other kind of illegal merchandise at the Anime Corner Store. and you will never find them here at the Anime Corner Store! Does this revelation have you in shock? Have you checked your Anime lately? If you've been taken in by a so called 'import' CD, DVD, or other Anime product at a store with a price tag that seemed too good to be true, then chances are that you've been duped. Don't get us wrong, the CD or DVD may play fine and the packaging may seem authentic, but the simple fact is that many of your hard-earned anime items are more than likely bootlegs from Taiwan, China, or Korea. These illegal items seem to be showing up everywhere, and the following will explain further the reality of Anime bootlegs, and how you can spot them. In the past, the problem with bootlegs has centered mostly around music CD's (which I will describe in length below). Recently though, there has been a rash of all kinds of bootleg products showing up, especially DVD's, VCD's, and Wall Scrolls. Be wary of any Anime DVD's that are presented as 'imports' that have Chinese or Cantonese writing on the DVD packages, and/or Chinese or Cantonese subtitles. These are almost always low quality, unlicensed pirates from Taiwan or mainland China. Currently I know of no legitimate manufacturers that produce Anime on VCD format, so if you see Anime VCD's being sold, you can be assured that they are almost certainly illegal bootlegs. Currently, Great Eastern is the only company that is producing licensed Wall Scrolls in the United States. All Great Eastern products have part numbers that begin with 'GE'. If you see wall scrolls that have part numbers that start with 'Z', or something other than GE they are almost certainly pirated merchandise produced in the far east. For CD's, just look at the spine of your CD's jewel case for the manufacturer part number. Authentic Japanese Imports all have a four letter company name, followed by a dash, and then a four or five digit number. For Taiwanese companies, the company name consists of only two or three-letter words which are usually followed by a three digit number. The majority of the time, the first release is marked with 001 in a similar fashion as the Japanese imports to make them look more authentic. SonMay Records LTD, Ever Anime, Alion, Archer Records, and Golden Diamond Music, Smile Face, Miya Records, & KO Records (to name a few) have been dealing in music CD's for several years, producing copies of Japanese CD's - copies that are legal to sell only in Taiwan. Why is this? Taiwan is not a signature member of the International Copyright Agreement (the Berne Convention, something you've probably never heard of), which requires each signing country to abide by worldwide copyright laws. Because if this they can freely produce copies of licensed CD's from other countries without regard to royalties, licensing agreements, or copyright laws. In recent years, large quantities of these CDs have been poured into foreign countries (mostly through gray market distributors) with expanding Anime markets, especially the United States. These CDs are, in many cases, being sold as originals at many pop-culture retailers, comic dealers, and especially online stores. It's not uncommon for the distribution companies to pretend they don't know where their products are going since they don't personally sell them overseas, and for the local and online stores to deny any knowledge of the origins of these CD's. The reality is that they become illegal bootlegs the minute they leave the shores of Taiwan. How is this possible? If they were really illegal, wouldn't the original companies sue them for copyright infringement and shut them down? No. Because Japanese anime producers historically haven't cared much about markets outside of Japan, and western anime licensors are mostly independent companies without the legal resources of the giant movie cartels, so there is an abundance of unlicensed illegal anime CDs and DVDs available. Still, how is this possible? If they were really illegal, the shipments would not pass customs, right? Wrong. It may surprise you to know that US customs only actually physically inspects less than 1% of total ocean cargo coming into the United States. Even if they did inspect more, US Customs is not responsible to enforce copyright laws, they have orders of priority more important things to worry about. 10 cases of pirated CD's or DVD's are exactly the same as 10 cases legitimate CD's or DVD's to customs, they are just 'DVD's' or 'CD's'. Bootleg importers have no problems with these products passing customs. So what are the real cost of these bootleg CDs? This will make you mad - any dealer can buy bootleg CDs in quantity for around $1.00 to $2.00 per CD. What?? How can they be that cheap? These are just mass production products - in other words, they are really just some fancy-looking CDRs. (The real crime is when some unscrupulous dealers try to sell these CD's as legitimate for $10, $15, even $20 per disk.) As an example of the lower quality production, some Taiwanese CDs use gold-foil discs to record on instead of the audio CD standard silver-foil discs. Though this becomes harder to distinguish as CD-R and CD-RW becomes more high profile, this can lead to production defects. That said, many of the bootleg companies have been trying to improve on CDs' quality over the past few years, with almost the exact look and the side slips that Japan imports always have, making these CD's harder to distinguish from the legitimate Japanese counter part. But the real cost of bootlegs is in higher costs for the licensed releases, or delays and even cancellations of high quality licensed dubbed and subtitled releases of some titles. If you've ever wondered why XYZ anime is not out on DVD yet, it might be because a company is having second thoughts going to the expense in releasing it due to heavy infiltration of bootlegs of that title already on the market. Beware of eBay and Amazon 'Marketplace'. Due to recent court rulings finding eBay not liable for the trade of Bootleg goods on their website, it is strongly advised to use a reputable legitimate retailer for your Anime needs rather than purchasing goods from eBay and similar online auction and trading sites. The sale of pirate merchandise seems to be on the increase on such venues and they are usually uncooperative when people complain about pirate goods being sold. Currently eBay seems to remove only really obvious pirate items from their auctions. Many people have tried and failed to get eBay to remove pirated Anime DVDs, CDs, and other goods from their listings, so be wary of any products you see with prices that are 'too good to be true'. While Amazon.com only carries legitimate licensed merchandise, many of the private sellers on Z-Shops and Amazon Marketplace list pirated merchandise under the same headings as the legitimate products, and they even use pictures of the legitimate licensed products in their listings. A good external site for more information about pirated Anime merchandise is the Pirate Anime FAQ. In the end, you don't have to worry about any of the products we offer at the Anime Corner Store. We simply won't sell these items, and are taking a stand among other increasingly profit minded retailers who don't seem to care what they sell, where it comes from, or what the quality of the item is. Even if it attractive, out of print in Japan, or something we can't obtain anywhere else, we simply won't carry anything except licensed, legitimate products. It's part of our standard of excellence - enough said. 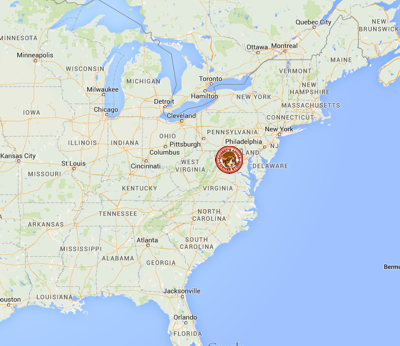 Our fulfillment warehouse is located in Winchester, VA USA. We are about 70 miles north-west of Washington D.C. Because of the small Anime fan base in this area, we decided a long time ago that while it would be great fun, it would not be prudent to try to operate a retail store in this area (at least for now). For this reason, we do not currently have retail hours at our warehouse either, mostly because it is a warehouse, and people would probably not get a great shopping experience shifting through hundreds of cartons of DVD's on flow rack, or having to get on a rolling ladder to get to a certain statue or toy. It is interesting to note that while we are located 'out in the boonies' so to speak, the Washington DC suburbs are getting closer and closer and we are considering several future retail locations in the DC area, but for now, we are at your service through the Anime Corner Store site online. Local DC area customers are 1 day service from our warehouse using Ground shipping. Indeed, the Anime Corner girls are a very special creation of the Anime Corner, and they run the show on the website. It surprises many people to find out that they all have names and unique personalities, challenges, hopes, and dreams. They are all conscious of their public image, though, and most of them try to keep much of their lives private - except for Noemi, who takes this Anime stuff a little bit too seriously if you ask me. She is the one who appears, with no coaxing, on every front page top banner, greets you on every information page on the site, and she seems to have at least a cameo appearance in every ad we run. She even got her face on our corporate seal, though I cannot remember how she talked us into that, she is very persuasive! Currently on the front page for the store, from left to right in the first row appears Aya, Momo, Asagi, and Enuko. On the second row appears Raina (who is our resident expert on J-Pop and Anime music), Uehara, Himiko, and Kuni. They, along with the others, offer friendly guides through the site and make it easier to navigate your way to where you need to go. We are currently working on a bio section, that we will post in the near future so you can get to know them even better! One could say that the only similarities are that both American and Japanese comics use images in a certain sequence to tell a story. Beyond that it's entirely different. Japanese comics and characters are owned by the artists (unlike famous characters like Superman and Spiderman, which are owned by their publishing companies). Japanese comics are read by everyone, male and female, young and old; even Japanese people who say they don't read comics actually do read them...but the comics are in the form of instructional brochures, owner�s manuals, how-to books, and short features in magazines. Comics are so pervasive in Japanese culture; people read them without knowing it. America has a long way to go before that happens. This is a very common question. The answer is that unless it states specifically otherwise in the item description, all the Anime that we carry is completely uncut and unedited. Generally, the studios include all the content on the DVD version that have to be edited out of the version shown on TV. Any edited versions will be clearly marked 'edited' or 'TV Edit' in the item description, and when there are two versions available, we always carry the uncut version. Yes indeed. Because we only sell the official licensed release, we carry only the DVD or VHS versions produced by the same studios that put the Anime on TV. 'Dubbed': Most of the people that still ask this question are probably really trying to make sure we are not carrying some Hong Kong dubbed bootleg, which of course, we don't. :-) 'Dubbed' simply mean that the original Japanese language dialog has been redone in English language dialog by professional voice actors. Keep in mind though, that not all dubs are created equal. 'Bi-Lingual' is the best of both worlds, and means that the DVD contains BOTH an English Language track, and also the original Japanese Language track with professional English text subtitles, and you get to choose to watch it in either or both languages. This is the great thing about releasing anime on DVD in that you can have multiple spoken language tracks on the same disk. A few disks even come with Spanish and French language tracks, in addition to English and Japanese, which is awesome! Most of the items that we carry in the store are the licensed domestically produced (made in the USA) versions, however, to fill in the gaps of what is not available here in the US we import many items directly from Japan. This is especially true with Anime Toys, Music, Art Books, and a few DVD's which simply are not produced here in the US. In the case of Anime music, the majority of our items listed are direct Japanese imports (we bring them in from suppliers in Tokyo and Osaka), and the few licensed domestic CD releases that exist are sprinkled in among them. Sometimes there will be both an import and a domestic release of the same CD, and we carry them both ways so you can choose (some collectors only want the Japanese import version, even though they are more expensive). Some stores carry illegal bootlegs from Taiwan, China, or Korea and call them 'imported' items (to make them sound more legitimate, or to confuse people into thinking they are real Japanese produced items). You won't find anything like that at the Anime Corner. When we say an item is 'imported' we mean it is the real thing brought over directly from Japan. What does region encoding mean for your DVDs or BD's? Will they work on my player? DVD REGIONS: Unless otherwise stated in the item description, all of our DVD's are encoded for play in at least Region 1 (sometimes 2 & 4 also), which is the North American DVD region. We do have a few Japanese import DVD's that are encoded for Region 2, which is Japan and Europe. Also, all of our DVD's are NTSC video format, as opposed to PAL format commonly used in Europe. If you are in the US, all of our DVD's will work just fine in your DVD player except for those few imports that are region 2. To play them, you will need a multi-region, or region free DVD player. The same applies to our customers outside of the US and Canada, who will need a multi-region or region free DVD player to play our Region 1 DVD's. Customers in Europe will also need a DVD player capable of playing the NTSC format, however, most new DVD players sold in Europe are now capable of playing both NTSC and PAL formats. BLURAY REGIONS: Simpler, with only 3 regions worldwide. All of our DVD's are encoded for play in at least Region A (sometimes also B), which is the North American BD region. Unlike for DVD's, North and South America share the same BD region with Japan, so our BD releases will also work in Japan and vice versa (though many Japanese BD releases won't have any English language content or subtitling on them). Complete information about region encoding and the DVD format can be found on our DVD Primer Page. We used to, however, so many Manga titles have now been licensed in the US and printed in English that demand for imports fell to nearly zero a couple years ago and we no longer carry them. Rest assured that if you are looking for a manga series that is not out in English yet, it will be soon and we will have it! Japanese Import Music CD's are produced in Japan, and we import them directly from Japan. Domestic music CD's are produced under license in the US, and are the US released versions of the original Japanese CD. This does not mean that the music on a domestic CD is in English, on the contrary, usually the domestic version is the exact same as the Japanese version, and contains the original Japanese music content, except with English labeling and usually a lower price due to the CD being produced locally. Of course, there is no region encoding for CD's (thank goodness! ), and any CD will play in any CD player, no matter where it was produced. Age ratings are actually a recent phenomenon in the Anime industry, and are long over due. Unfortunately, there is no standard age rating system used by the US Anime studios. Some studios use a home video version of the Motion Picture Association content rating system, and other studios have chosen to use a version of the system currently in use for video game content. Some studios do not provide age ratings at all. We are currently building in suggested age ratings on all new titles, and are working back through our catalog to provide age ratings that we feel are appropriate to our older titles. Occasionally, if we have seen that Anime, we may set the age rating a bit higher than the studio if we feel that the content is not appropriate to that particular age group. Personally, I've always felt that the MPAA, ESRB, and other organizations tasked with rating content set a minimum standard at best, so we won't always agree with them. Also keep in mind that these ratings are just suggestions, and we recommend that parents who are concerned about what their children are watching (that should be all of you!) should preview the title first to ensure that they feel the content is appropriate. Some titles that are fine for a 15 year old, may not be suitable for a 13 year old. Also, remember that many of the titles that are shown on TV are heavily edited, and the DVD releases often are original uncut versions and include content that may not be suitable for the same age group watching the TV version. For instance, there are no swear words on the TV version of DragonBall Z, but there are plenty in the uncut version released on DVD. If you are a parent of an Otaku, here is an excellent database maintained at Anime Cafe's site called 'A Parent's Guide to Anime'. It's worth a look if your not sure if the content of a particular anime might be suitable for your son or daughter. If you do have any questions, please feel free to e-mail us and we'll help you as best we can with this. In Japan, there is a very large direct to video market (more so than here in the US, though that is slowly changing). Many Anime series start life as an OVA, or Original Video Animation, and are released directly to the home video market. Sometimes it works the other way when a popular TV series will be followed on or continued by a shorter OVA release. Tenchi Muyo is a great example of a series that has seen production in every format. It started off as a 36 episodes OVA series (but only 13 episodes were ever made), released directly to video and not shown on TV, then 2 complete TV series where produced (another one is coming), and finally 3 high quality theatrical productions that appeared in Japanese movie theaters. As a rule of thumb, an OVA is usually a higher quality production with better animation and music (since it is not produced to the rigorous time constraints that TV products are), but will be shorter than a TV series, usually from 2 to 6 episodes (sometimes more). This is not to be confused with the popular 13 episodes TV series shorts that are popular in the later time blocks in Japan. Movies, of course, are generally to highest quality, but shortest productions. I have to admit, that the answer to that is much bigger than the question. If you ask 10 Anime fans this question, you'll get 11 different answers. There are so many different Anime titles, and there are so many diverse tastes that it's almost impossible to recommend titles to someone, but we've gotten together and compiled a short list of our favorite titles that might help you out. I heard that you allow trade ins of used DVD's, CD's, and Manga. Is that correct? We will happily take your use Anime DVD's, Domestic Anime CD's, Japanese CD's, or Manga (English Language) in trade for store credit. You can now also trade in regular movie or TV show DVD's and regular old CD's you might have lying around for anime credits. See #2 below for instructions. How can I trade in my used Anime DVD's, CD's, Manga, or Video Games for store credit? Trading in your new or excellent condition previously viewed Anime DVD's, CD's, Manga, or Video Games for store credit is easy! *As a rule of thumb, we typically will offer around 10-20% of the original converted Japanese (Yen) MSRP for any given figurine. New and sealed figurines will garner a higher value than previously opened ones. Figure trade ins must be in NEW or MINT condition and in the ORIGINAL packaging. Since the original price for figures varies widely we really need to evaluate your trades in on a figure by figure basis. Smaller figures like 1:8 and 1:10 scale will be worth less than 1:7 or 1:6 scale figures. Blister carded figures will be worth less than window boxed figures, and so on. Unfortunatley we are unable to offer quotes of value prior to actually receiving your figurines for inspection. *Video games will only be accepted for trade in if they have a legitimate UPC code. Promotional games and other games with no commercial value like previous years editions of sports games will not be accepted. *This Includes ANY licensed non Anime DVD or BD or regular live action movie or TV series DVD or BD sets. Make sure to write 'Anime Trade Ins' on the outside of your box. Once your trade ins arrive in our warehouse, we will inventory and inspect them, tally up your trade in credit, and e-mail you a store coupon for the amount of the trade in credit that you can apply towards your next order here at the Anime Corner. Please allow 7-10 working days from the time your trade in arrives in our warehouse for your coupon to be issued. 2) Extra's disks and Digital copy disks aren't eligible for credit. 3) BD's, DVD's, and CD's will be tested, and those with scratches, defects, missing parts, broken cases, or play-back problems will be rejected. 4) All trade in BD's must be Region A and DVD's must be Region 1 (North American) compatible releases. 5) Books must be in excellent condition and cannot have bent corners, missing pages, torn spines, etc. We do not currently accept Japanese Language manga for trade in. 6) Items that are shipped to us that are not in excellent condition will be rejected and returned to you without credit. 7) We will not accept non-licensed anime releases or bootlegs for trade in credit, and we will destroy any of these items sent to us without credit. If you are not sure if your BD, DVD or CD is a bootleg or eligible for trade in, make sure that it's issued by one of the major US studios, or just check the store to see if we carry it. If we carry it, it's legit and we will accept it for trade in credit. 8) Trade in customers are responsible for the cost of shipping their items to us and this cost cannot be reimbursed. We recommend using a trackable shipping method when sending us your trade in items, and for you to consider insuring your shipment. We cannot be responsible for any items shipped to us that are lost or damaged in transit before they reach our warehouse, and we reserve the right to reject any materials that we do not deem appropriate to our trade in program. Please be sure to e-mail us if you have any questions regarding trading in your Anime! Thanks! Many times we are asked "Once you buy my used DVD's, what do you do with them?". Currently, we do not resell used or traded in DVD's or CD's at the Anime Corner Store. We dispose of your used anime through secondary market channels (though I must admit, a few of them end up in the personal collections of some Anime Corner employees, who will remain nameless.....-_^). We provide this as a service to you, rather than some additional means to make money. That's easy! Just click here. You can search the store by any keyword, by format, even by genre. We currently do offer some great coupons and special offers from time to time, but mainly to our Newsletter subscribers. If you'd like access to these offers, make sure to sign up here. We send it out about once a week, and it's chock full of news, new release info, reviews, and lots of other good stuff. Rather than have an incredibly expensive web integration with our inventory system, we simply strive to keep every item listed on the store in stock and ready to ship at all times. This is what it means when an items says "Stocking Item" - unless that item is currently backordered from the manufacturer, we should have it in stock and ready to ship in our warehouse. The nature of some items also makes this a little harder to always keep them in stock, like Import CD's which have long lead times (usually a few weeks). Some domestic Manga also comes to mind, because in the US comic book business many publishers are tiny little companies with limited resources, which is why some titles can go into 'reprint' statues for weeks or months at a time. Other items like apparel or toys which are only subject to one production run and then discontinued. Items like that will be listed as in stock while we have them, and then changed to 'Backordered' (if we think we can obtain more at some point) or 'Sold Out' (if it's gone forever and we're probably SOL) status once they are gone. While we update the status on these items every 24 hours, it is inevitable that 2 people will occasionally order the same item in a 24 hours period when there was only 1 left. In that case, the item is first come, first served, and the item will be marked as backordered or sold-out on the other customer's pick ticket. Our prices are always in US Dollars. If you'd like to know how much something costs in your home currency, you can use this currency converter. Your browser is not set to accept 3rd party cookies, or has it's cookie feature turned off. Your internet firewall software is blocking 3rd party cookies. You may be blocking or have disabled the "Cookies" function on your browser or you have a software program (like a personal firewall program from Mcafee, Norton, Zone Alarm, etc.) that is blocking the shopping cart cookie, and you must have cookies enabled for our shopping cart to function properly. This is actually safer and more private than if our software stored your shopping cart on our side. We use Yahoo's ultra secure server side solution to host our store, and the shopping carts of all 120,000 Yahoo stores on the web work this same way. The only way we could solve this problem of cookie blocking on our end would be to implement server side session ID's, and that would be a much less secure way to track your shopping cart. For Microsoft Internet Explorer, choose "Tools," then "Internet Options," then " Security Tab," then "Internet," and finally choose "Default Level". For Netscape browsers, choose "Edit," then "Preferences," then "Advanced," and finally choose "Accept All Cookies". If your are using AOL's or Apple's browser, please contact their customer support to find out how to enable cookies for your particular version. If this does not resolve the issue, you might still have your browser security settings set too high. You can solve this problem without altering your security level settings by setting our store are a 'trusted' site in your browser software and/or in your firewall software so the software will allow the store to set our shopping cart cookie within your browser. Zone Alarm firewall software in particular causes a great deal of problems with our cart, because at the default settings it blocks almost every third party cookie to your browser. For those folks running firewall software, we find that disabling it during your shopping session usually solves this problem. If you still need help, please feel free to contact us at <customercare@animecorner.com>. Why don't you guys show the retail price (MSRP) of the items on the store? If you did, people would better understand how good your prices are! This is the type of pricing structure you'll see at stores like AnimeNation and RightStuf (even Amazon! ), but those prices are misleading in that while they want you to believe you are saving 10%, you may actually be paying 15-25% MORE than you would if you bought the same item here at the Anime Corner. We've always felt that Anime consumers are too smart for that kind of approach, and we don't use that methodology. For import items, posting the retail price is also not very relevant, since the original Japanese price would be in in Yen, and the dollar price would vary widely depending on the currency conversion at the time. Still, we do post the retail Yen price for Japanese import CD's to give customers a frame of reference when shopping around, they can see that many other sites charge MUCH MORE than the converted Japanese retail for import CD's, again taking advantage of the fact that consumers may not know how much these items actually cost in Japan. Finally, retail price is not very important at the Anime Corner Store because we price our products based on our cost instead of a discount off retail. This is why prices in our catalog vary from studio to studio, and it allows us to keep our pricing as low and, more importantly, as fair as possible. Other stores will cut a little in one place, and make huge profits in another place because they know the consumer doesn't know that they pay far less for some products than others. We've always felt that this was a rather dishonest and gimmicky way to price products, and we don't do it. We hate gimmicks! We try to keep our everyday prices as low as possible for everyone, however, we can offer discounts for large purchases made by libraries, non-profit organizations, and legitimate established Anime Clubs sanctioned by an accredited College or University. We sometimes can also provide promotional items to Anime Clubs in exchange for endorsement of our store to their membership. E-mail Robert with your request, information, and description of your organization to see if you qualify. You can always count on the Anime Corner to have some of the best pricing on popular items all across the store, however, it is not in our best interest, nor in our customers best interest, for us to always try to be the 'cheapest' or have the 'lowest prices' as this would dampen our commitment to service, and would not be a fair or ethical way to do business. Many stores try to lure customers into buying now with discounts on one line or with only a few weekly specials on products that they have in excess (probably because their price on it was too high to begin with) selling them at or below cost to bait consumers, and then price everything else in their store much higher than we do. These stores also don't take the effort to ship quickly, or keep all their items in stock like we do, or offer great customer service like we do. We offer the same low prices all day, every day, to every customer so you can buy what you want when you want it, and not wait until someone else decides to put it on sale for a price that has to make you wonder why they don't offer that price on that product in the first place. Instead of using these sorts of retailers gimmicky pricing strategies, we try to price fairly for ALL of our Anime items across the store, and I think you will find that we offer the best overall value. A price matching policy is also unfair in that if we were able to offer an item for a lower price to one customer, then ethically we should offer that item at that price to ALL of our customers ALL of the time. This is what drives our currently pricing policy - to make sure that we offer the very best prices possible to ALL of our customers in the most fair and ethical manner possible. Regardless of whether you agree with this or not, I simply won't have it any other way. Our commitment has never been to be the 'cheapest', it has always been to offer the best possible everyday prices, selection, and delivery without compromising the great service you have come to expect from the Anime Corner Store! *While it is our general policy not to accept Bank Wire Transfers or Western Union Money Transfer payments, we do recognize that sometimes these may be the only payment option available. Please e-mail us if you are placing a large order, but are only able to make payment this way and we will try to work with you as best we can. Because there is not enough demand for it to make it cost effective, we currently do not accept phone orders. We have repeatedly considered this and done customer surveys, and the vast majority of our customers are just not interested in contacting us by phone. In fact, many customer place orders specifically request we do not call them about orders, but contact them only by e-mail. When you send your order in, be sure to include your name and address, e-mail address & phone number, list if items you are purchasing, and your payment (or payment info). Don't forget to add the appropriate shipping and handling charge before sending in your order. This only applies to credit card orders, and is usually not a problem. Just let us know in advance or on the order form why you want it delivered to an address other than your CC's billing address. Your order will be briefly reviewed by our security dept. prior to processing, and we will contact if we need any more information. Yes, if your order has not been processed for shipment, we can usually amend it. Just E-Mail us as soon as possible with any order changes or additions. If you checked the confirmation box on the order from when you placed your order, our store automatically sends you a confirmation e-mail a few seconds after you complete the checkout process. The store will also send you another e-mail confirmation with tracking info when we tell it the order has shipped out. If a confirmation is not delivered to your e-mail box within a few minutes after placing your order, one of three things has probably happened. You may have typed in your e-mail address incorrectly. If you think that might be the case, please send us an e-mail letting us know. The confirmation e-mail may also have been caught by either your local or your ISP's spam filter software. We especially have problems with this when folks use 'hotmail.com' and other free e-mail service addresses for their order communications, or are using AOL and have their browser security settings set to a very high level. Finally, since our confirmation e-mails are electronically generated, some e-mail programs will assign them 'bulk' mail status, and you may find your confirmation in the 'bulk mail' folder of your computers e-mail program. If you think either of the last two might have happened, you can set your e-mail client to accept all e-mails from 'customercare@animecorner.com', or all e-mails from our server side address of 'st124.store.yahoo.com' or IP address 216.136.225.124. This should prevent future e-mails from being filtered out and make sure they show up in your systems inbox. Currently, we do not accept payment via COD (collect on delivery). All order must be pre-paid before they can ship. We are always working to make your shopping experience as fun and convenient as possible, but with security a high priority as well. While our store software includes the capability to allow customers to create 'accounts' and log into the site, we have chosen thus far not to incorporate this feature into the store. Your privacy is very important to us, as well as the security of your personal information. Sites that allow customers to create accounts must store that customer's personal and payment information on a web server that, no matter how secure, has the potential to be hacked. When you place an order here at the Anime Corner Store, your personal information is transferred securely from your desktop to a closed system that is not accessible to the outside world, preventing any threat of theft of your personal information. We feel very strongly about this matter, and we apologize for the slight inconvenience of having to enter your info each time you order, but we think that until someone invents an unhackable system this is the best way to do things for now. Our order processing system performs real time authorizations on all orders placed using a credit card. If your are getting this message it means that your credit card's issuing bank is declining the charge for your order, and you need to contact their customer service dept. directly to find out why the charge is being declined. Get a credit or debit card from your bank. By far, the easiest way for overseas customers to pay for an order is with a major credit card (Visa, Mastercard, Visa Electron, or any debit or e-card with a Visa or MC logo). If you do not have a major credit card, we can accept cash (US Currency Only), postal money orders (made out in US Currency Only), and bank money orders or bank checks as long as they are drawn off a US bank. We can accept Canadian personal checks as long as the account is a dual currency account and allows you to make the check payable in US Dollars. If you have a BidPay account, you CAN use their service to send us a hard copy money order in US currency, however, we CANNOT accept a 'money transfer' from them. *While it is our general policy not to accept Bank Wire Transfers or Western Union Money Transfer payments, we do recognize that sometimes these may be the only payment option available. Please e-mail us if you are placing a fairly large order (over $2,500), but are only able to make payment this way and we will try to work with you as best we can. Yes, we will happily hold your order until it can ship complete, but you must request this on order form when you place the order. Just check the 'hold ship complete' box on the order form and we will wait to ship your order until ALL items on it are in stock and can ship together. There is also a situation that comes up from time to time with 'ship complete' orders when we will need to charge your order now, even though it might be shipping at a later time. This occurs when there is a limited edition or some other item on the order that may no longer be in stock by the time the order ships, and allows us to physically set aside a copy for you while we do have it in stock to ensure you get everything on your order. When you check the hold ship complete button on the order form, you are authorizing us to charge you for the order if we need to before it actually ships. We offer several different shipping methods so that you can choose how quickly you want your order delivered, and how much you want to pay for shipping. Currently for US domestic orders we offer 2-3 day Priority Mail service as well as UPS or FedEx Ground (each have their own advantages). We also offer FedEx 2nd Day Air, and FedEx Next Day Air shipping for those of you that need your anime in a hurry. International customers can choose from economical Air Mail / Global Priority mail, faster EMS or FedEx International Priority, and ultra fast DHL International Priority to have your order shipped. Please see our ordering and shipping page for more information on the shipping methods we offer. FREE Super Saver Shipping is available for orders over $50. Just select our Super Saver Shipping option and apply our FREESHIP coupon to your order. All shipments against your order that do not meet the $50 minimum will incur the regular super saver shipping fee. Remember, PRE ORDER ITEMS DO NOT count in your shippable total unless you tell us you want everything to ship toghether (Example: If your order is $80, but $40 of that is pre-orders, the order will NOT qualify for our free shipping offer and will be billed the regular super saver shipping charge for a $40 order.) Our FREESHIP coupon offer may not be combined with any other coupon or discount offers. We hear often from new overseas customers inquiring as to the cost to ship to their particular country. This question seems simple, but it not easy to answer. Overseas shipping costs have increased significantly over the past couple of years. Our store is programmed with a set of very complex shipping matrixes that allow it to calculate overseas shipping charges during the checkout process. Once you have completed creating your order, you will be able to choose from several international shipping methods during the checkout process, and compare various shipping rates. See our shipping and ordering page for the international shipping methods available. Your final total including your freight charge will be available prior to completing your order. Weight is important in the calculation. Orders for manga will inevitably be more expensive to ship across all service classes than orders for DVD's, since manga are books and will be heavier, even though the value of a DVD order might be much higher than the value of a book order. Size is also very important. Certain shipping classes have size and weight limits. For example, we can use air letter post class for Airmail up to 4lbs, however, orders over 4lbs have to ship air parcel post, which is usually more expensive per pound. Also, all carriers are now determining weight classes by the size of the parcel, so the actual freight calculation weight can be much higher than the actual ship weight. In May of 2007 the US Postal Service completely eliminated economy shipping (surface mail) for overseas shipments, and consolidated all other freight classes into the more expensive International Priority Mail (used to be Airmail), and the faster EMS (Express Mail) services. Rates for both mail classes are subject to dimensional weight calculation. For commercial services, like FedEx, shipping rates are often calculated by the volume of the parcel. There is a flat rate for shipping in one of the 4 or 5 standard sized boxed that they provide, but all other shipping carton are rated by volume (DIM), which means that if we are shipping FedEx and your order will fit in a flat FedEx box, the rate would be determined by actual weight, but if your order needs to be shipping in a larger box, the rate would be calculated by the volume of the box. A great example of this would be if you were to order 8 individual DVDs, it would ship in a flat box and would ship for the 4lb rate. If you ordered 8 DVD's and an art box, it would still physically weight only 4 lbs, but would have to ship in a 12 x 12 x 8 box, which would ship at the 9lb rate because of the volume of the box. Shipping rates for almost ALL orders for figures and toys will be calculated by volume and not actual weight, and because of the various fuel surcharges and volumetric calculations shipping rates for toys can be rather high no matter what the actual weight of the parcel will be. In some cases for smaller orders, the shipping cost can equal the cost of the goods being shipped, and larger orders will always ship more economically than smaller ones based on unit costs. As you can see by this simple example, there is a great deal more involved in calculating your international shipping rate than just determining the weight or destination of the parcel. The order confirmation e-mail that you received when you placed your order contains a status link that you can use to check the status of an order. Of course, you can also e-mail us directly and we will provide your current order status. Please include your full name and/or order number when e-mailing us to help us get back to you as quickly as possible. Please note that Airmail and most APO/FPO shipments are NOT trackable, and we cannot obtain a delivery status on them once they leave our warehouse. I tried to track my order on the US Postal Service site, and it says that they only been 'notified electronically'. If the package has been sent, why hasn't the tracking been updated? We get this question a lot, and the answer is not as easy as many people think. Delivery time will depend on what you order, how you select to have it shipped, and where you live in proximity to our warehouse. Please see our shipping and ordering page for more information. Yes indeed! Everyday. We pride ourselves in serving the Anime fans in all of our military services. For orders shipping to APO or FPO addresses, enter your shipping address exactly as it has been assigned to you by your overseas duty station. The shipping country you should choose is the United States, regardless of where your actual duty station is overseas or aboard ship. APO & FPO orders always ship via Priority Mail to the designated Army Post office (AP) or Foreign Post office (FP) here in the US, and then they will forward the package to you at your duty station overseas. For our part we treat these orders just like a regular orders shipping inside the US, even though the AP will be sending the parcel to you at your overseas duty station. Mail to US soldiers serving abroad, no matter where you are, is considered domestic US mail. OK, Priority Mail shipping only costs $5.05, yet your minimum shipping charge is $6.00. What is up with that?! Hey, throw us a bone, will ya???!!! This is a question we get occasionally, and it always makes us chuckle a bit, but I wanted to spend some time and explain in detail how we come about our shipping charges. First - Priority Mail is not $5.05 except for shipments less than 16 ounces. Over 16 ounces, Priority Mail rates are determined by zones, and can vary quite a bit from one place to another. Our rates are fixed so that someone in Alaska does not pay any higher shipping charges than someone living 10 miles from our warehouse. Robert believes that this is a very fair and simple way to deal with shipping charges, and we get a great deal of positive feedback from customers who appreciate it since most of our, even small, order shipments weigh over 16 ounces. Second - Even a parcel less than 16 ounces shipped Priority Mail costs us quite a bit more to send to you than just the $5.05 shipping fee. The order has to be processed, pulled, written up, boxed, labeled, and confirmed. Shipping and packing materials have to be used. We actually make very little or no profit at all on a small $10 or $20 order, due to the backend costs involved with processing that order (which is about the same as processing a $100 or $200 or $500 order), yet we have set the minimum order on our store at only $10 because we want to serve ALL Anime customers, not just the ones that can afford to spend $100 or more every time they shop here. Like everything else at the Anime Corner, we try to keep our shipping and handling charges as low as possible, while still providing you the best and fastest shipping services possible. This is why we don't use cheaper less reliable services (like cheap but unreliable media mail). Unlike other stores, we also try to give you many different shipping options so you can choose how and when you get your order. We think this is very important, and spend a great deal of time working to give you the best possible value for your shipping dollars. Super Saver Shipping only applies to your in-stock items. Pre-order items have to ship separately at a later time and are considered a separate order, therefore, we have to charge shipping for pre-order items. Please see our Super Saver Shipping rules for complete information. Not all orders currently qualify for Super Saver Shipping. In order to offer you the best possible service, but not loose too much money on our free shipping offer, we had to implement a few restrictions. Pre-Order items do not count in the calculation for Super Saver Shipping because pre-orders are not yet available from the manufacturer and must ship separately. To illustrate this, lets say a customer places a $200 order for in-stock items, and selects free shipping. Our cost to ship that might be $8-$10. Lets say another customer places a $200 that contains eight pre-order items. Our cost to make 8 separate shipments on this one order might be $40 or more. So you can see that because we already try to keep our prices a s low as possible, but still offer you the best possible service, we had to exclude pre-orders from our Super Saver Shipping offer. As a rule of thumb, pre-order items are handled on this end as separate orders. You can request that we hold your order until it can ship complete, or you can order your pre-order items on a separate order, but your shippable total for any one shipment must be over $100 for your order to qualify for free shipping, so please keep this in mind when you place an order that contains pre-order items. If you still have questions about this, please e-mail us! Please see our Super Saver Shipping Rules for complete information. In most cases, wall scrolls, posters, rolled Japanese calendars, and a few other type of items have to ship in a separate mailing tube due to their odd size, unless of course you request that we saw them in half prior to shipment..... -_^ When you order one of these items we will automatically recalculate shipping and add a small additional shipping fee to cover sending 2 parcels. For FedEx 2nd Day and Overnight Air shipping where the shipping charge is based partly on the number of items I order, does a 6 DVD bundle count as one item or six items? You will not be charged for the item until it actually ships out to you unless you tell us differently. You can pre-pay for a pre-order item, however, we will not reserve a copy for you until your payment actually arrives. For this reason, you need to send us your payment as soon as possible after you place your order, just like you would for an in stock item. This is especially important if your ordering a special or limited edition item. If you place an order with multiple pre-order items shipping on different dates, we will e-mail you and let you know how much additional shipping we will need to cover all the separate shipments, and give you the option to perhaps batch some items together to save shipping charges. We do our very best to keep all the item listed on our site in stock, but with over 80 major vendors providing items to us from all over the world, it's sometimes not possible to account for manufacturer stock outs, distributor mis-shipments, or items that temporarily go out of production. If you have a backordered item on your order, don't worry, we'll do our best to get it out to you as soon as possible. And, of course, backorders at the Anime Corner always ship freight free so you never have to worry about additional shipping charges because an item is out of stock. As is common in the Japanese Anime market, many licensed Anime items (like statues, toys, and t-shirts) or are produced only once, so we are unable to re-order them once we sell out. There are also times when, for instance, and manga or CD may go out of print for longer than we feel comfortable holding a backorder for it. While we update our website every 24 hours, it is inevitable that from time to time an item like this will sell out before we can update it's status. Yes, we can special order any Japanese CD or DVD that is currently in print. Special orders can take 6-12 weeks for delivery, and we require payment in advance for any item that we special order for you. Special orders are not cancelable, and special order items are not returnable. You will be charged for the special order item at the time the order is placed. Please see our special orders page for complete information. We carry every domestically released Anime and Manga title, so if you don't see it listed on the store more than likely it's not yet released, or is out of print. Even so, please feel free to e-mail us if your looking for a particular title or have a quest and we'll be happy to check into it for you. We try to keep our costs down by limiting returns and we ask all of our customers to order responsibly so that they will not need to return an item. In exchange for your understanding, we immediately advance replace defective items and in most cases* provide postage paid mailers for the return of the defective items (*U.S. Customers Only). Return of any item to us requires an RA number be issued in advance. If you return an item without an RA number, we will not credit the return and the item will be shipped back to you at your expense. Please see our returns policy for more information. E-mail us immediately and we will replace the damaged or defective item with a minimum hassle to you. It's as simple as that. Most of the time problems playing a DVD indicate a defective disk that we can exchange for you. Occasionally though, DVD's will have a problem from the manufacturer that can effect some or all the DVD's in that production batch. If you are experiencing a strange problem with a DVD you purchased from us, be sure to check our DVD Technical Bulletins Page to see if we have posted info about it, and be sure to inform us of the problem. When we receive reports of the same problem from several customers, we will pass the information along to the manufacturer so that they are aware and (hopefully) take corrective action on the issue. We get reports of this sort of problem from time to time. While your disk may indeed be defective, it may also be experiencing a compatibility problem with your Play Station game console or your computers DVD-Rom drive. Alas, many of the major Anime studios do not test DVD's on game consoles or DVD-Rom drives when they are being authored, and while they will work in those devices most of the time, there is no guarantee of compatibility. Bandai, for instance, generally will not consider a DVD defective if it fails to play on a PS2 machine, but does play OK on a normal DVD player. If you do experience a problem with a DVD playing on your game console or DVD-Rom drive, please test it on a normal DVD player (if possible) before you report it to us as a defective disk. If it does not play on a regular DVD player, or has the same problem, it is probably defective. If it plays OK on a regular DVD player, then the disk probably has a compatibility issue with your external device that may require you to upgrade the software or hardware on your game console or DVD-Rom drive. You can also check our DVD Technical Bulletins Page to see if any announcement has been made regarding your particular problem. Because of the scope and breadth of DVD player hardware on the market, we cannot accept returns for DVD's that have issues playing on peripheral devices, but will always exchange DVD's that are problematic playing on regular DVD players. If you experience such a problem, please be sure to inform us so we can at least report it back to the manufacturer. No, we cannot accept a return for this reason. Anime, like most other things in life, is somewhat of a gamble.